It is a sight that only divers get to see. Beams of light literally making a sharp left turn underwater. 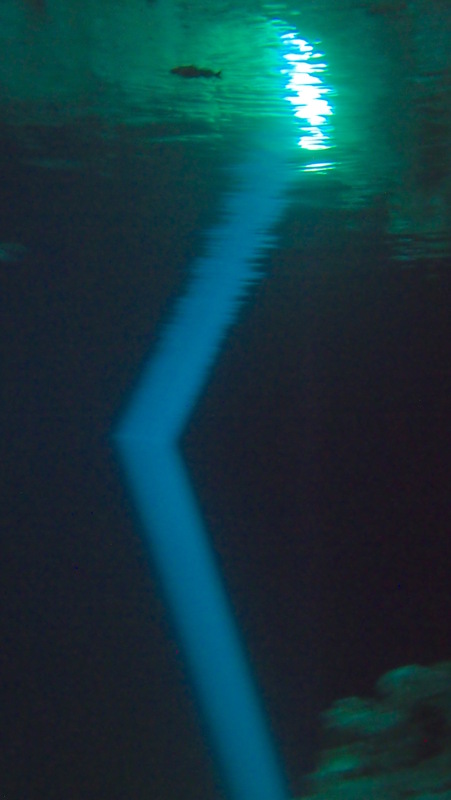 In some Mexican caverns (cenotes) divers can witness and photograph light being bent! If the direct rays of the sun pierce the forest canopy and shine through a small hole in the cenote's roof, it just might happen. Rare sight for divers, rays of light switch direction! It is a sight that only divers get to see. Beams of light literally making a sharp left turn underwater. In some Mexican caverns (cenotes) divers can witness and photograph light being bent! If the direct rays of the sun pierce the forest canopy and shine through a small hole in the cenote's roof, it just might happen. If other visitors haven't stirred up the 15 metre deep water inside that cave it just might happen. If both things occur then you could be one lucky diver who gets to see a shaft of sunlight dramatically cutting through the water and bending sharply near the midpoint of the cenote. In Mexico's Yucatan, it was in the Cenote Jardin Del Eden -- the Garden of Eden Cavern -- that a group of divers saw and photographed light being acutely twisted as it passed from open air, through fresh water and into salt water.
" It depends on the conditions," explained guide Christian Brais Casqueiro Santiago, a certified cave diver with the PADI 5-Star Pro Dive Mexico operation. " 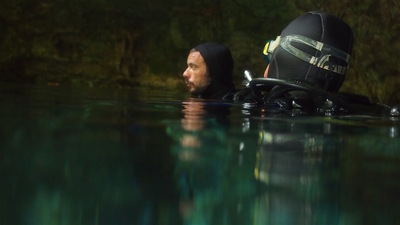 The sun has to come through openings in the top of the cenote near the noon-hour. It bends when it passes from freshwater to saltwater ... that halocline has to be still (to get the most dramatic shift in direction)." Canadian divers are used to encountering thermoclines -- layers of increasingly cold water -- as they descend towards the bottom. The cline that Chris Santiago refers to is a halocline where fresh water flows over top of salt water. In the extensive Mexican limestone cave system (there are an estimated 7,000 cenotes, many of them linked, in Mexico) cool fresh water travels from the interior of the Yucatan into the warm super-salted hot waters of the Caribbean Sea on the country's east coast. Depending on the tides, and the depth of the incoming cave tunnels, salt water from the Sea does make it back into the cenote. The salt infused water is denser than the fresh water and as a result, if not disturbed, it lies on the bottom beneath the freshwater. Saltwater fish can sometimes be found swimming underneath freshwater species! For a diver passing through the halocline there is a noticeable change in one's vision. Where fresh and salt meet, divers will find their vision badly distorted in the shimmering zone. The layering of the cave water also impacts how light travels through it. As the light passes through a boundary between two different water densities, the beam is refracted -- this allows light to bend backwards at a negative angle. In the science of optics, Snell's Law explains this bending of light through two different isotropic media. The group of four European divers I had glommed onto earlier that day weren't thinking about Snell's Law when they picked up their gear (Nitrox tanks, state-of-the-art BCs and halogen dive lights) at the Pro Dive Mexico (PDM) shop in the five star Occidental Hotel in the small mainland city of Playa Del Carmen. They were looking forward to filming root fish and cleaning the salt out of their gear after a week of intensive drift diving off the nearby island of Cozumel. They had stayed at a PDM/Occidental all-inclusive scuba friendly resort on the island and had taken the morning ferry over to join me. 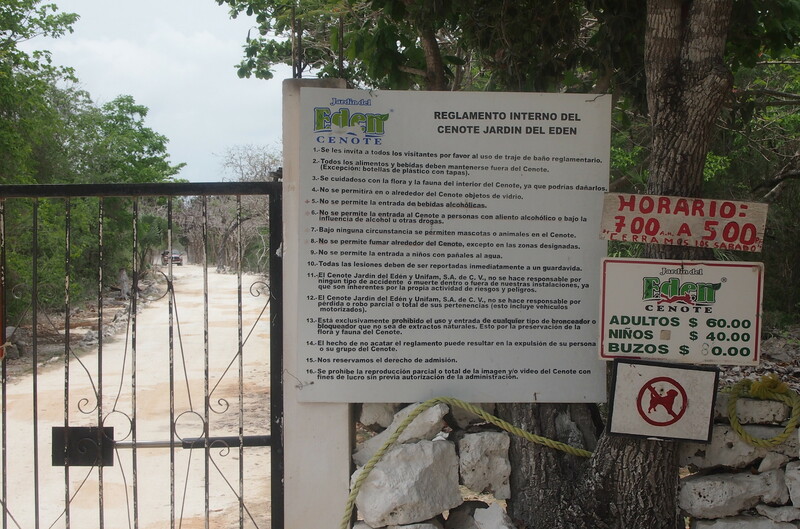 It was a half-hour drive down the paved coastal highway 317 to the road leading to the privately owned cenote. There was one other group in the cave side park when our van and gear truck arrived -- today only divers with registered shops are allowed to dive. The Garden of Eden is often referred to as the Ponderosa because it is an expansive cave. There are wide tunnels and tall spacious galleries. 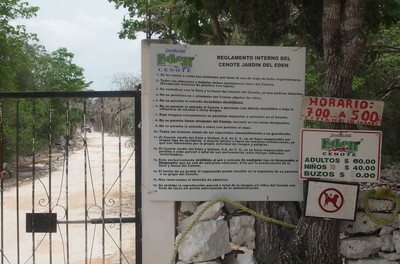 There are fish filled passages that lead to other cenotes. 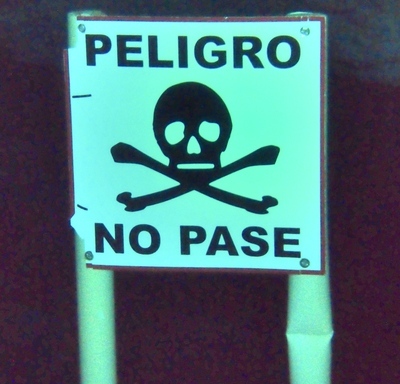 Danger signs with skull and crossbones warn divers from exploring off-shoot channels. Although my companions stayed the course, the death warning signs were popular selfie stops for divers with Go-Pros on sticks! The visibility is 75 metres and at a depth of 15-metres our full suits keep out the chill from the mountain waters. Although divers are never far from open air, the lights are always needed. Although the diver pressure on the cave is intense and never-ending there are still stands of unbroken soda sticks, stalactites, and stalagmites. Our goal was to reach a gallery where the roof has fallen, The forest had taken over and much of the hole was filled with the roots of trees. My companions want to photograph the lively eco-system of plants and fish living under the roots of the tree. The dive team got their pictures and we headed back into the dark. We were in a water filled cathedral when our guide signaled us to stop. A beam of light lay straight ahead. We could see that a hole in the ceiling was acting as its iris, making it a tight beam of baby blue. There is a gap of air between the ceiling of the cave and the water, as the light beam enters the water it appears to lose some of its focus. The light follows a left slanting path downwards until it hits the halocline. The light beam takes that sharp turn backwards forming an acute angle in the middle of the cave. Strange. Fascinating. Worth the trip. Snell's Law is proven once again. It is a temporary phenomenon. Back at the parking lot, we strip out of the gear, relax and eat the lunch the dive shop brought. We talk to the members of a dive group that went through the cavern before us. They didn't see the light bending backwards on itself. The sun moves in a predictable path across the roof of the cave. The daily phenomenon is dependable but timing is everything making this case of the bends gloriously worthwhile. All photographs by Stephen Weir.